Two strawberry viruses are causing problems for strawberry growers in Eastern and Mid-west states this spring. The viruses (strawberry mottle virus, abbreviated SMoV) and strawberry mild yellow edge virus (SMYEV) have been found in Pennsylvania, Virginia and New Jersey this spring. Both viruses are not new to strawberry in the US. Unfortunately for the industry, infected plants were unknowingly distributed to strawberry producers throughout the US. Last fall, some strawberry growers in southern states began noticing poor growth in their fields, sometimes in spots within fields, sometimes in virtually the entire field. Older leaves sometimes turned bright red in color, while the edges of leaves around the crowns of plants, and/or emerging leaves, showed a distinct yellowing, which sometimes developed into patterns of marginal necrosis (i.e., dead tissue along the margins of leaves). Roots and crowns of most of these plants showed no sign of fungal infection. Initially, the cause of these problems was thought to perhaps involve soil and/or fertility conditions, such as low soil moisture and/or pH, boron toxicity, or fertilizer burn, perhaps associated with weather and/or errors in custom-blended fertilizers. However, similar problems were observed in Florida, North Carolina, and other southern states as well as Virginia. Because of the widespread nature of these symptoms, and an apparent association with bare-root plants or tips from the Great Village area of Nova Scotia, Dr. Barclay Poling of NCSU travelled to Nova Scotia in early December to visit with Canadian strawberry plant growers and Extension staff. While there, Dr. Barclay was told that apparent strawberry virus symptoms had started showing up in fields of some strawberry cultivars in Great Valley in October. The Canadians who had not had this problem before, and contacted Dr. Bob Martin, a USDA-ARS small fruit virologist who is an expert on small fruit/strawberry viruses located at Oregon State University, to help determine the cause. Dr. Martin collected plant samples in early November to take back to Oregon for laboratory testing. Dr. Martin found Strawberry Mild Yellow Edge Virus (SMYEV) and Strawberry Mottle Virus (SMoV) in samples from several matted row varieties. Dr. Barclay noted that he had never before seen strawberry viruses to be a problem. Dr. Barclay also noted that ‘Chandler’ plants in Canada looked healthier than other varieties he saw, such as ‘Camarosa’ and ‘Winter Star’. Upon returning to NC, Dr. Barclay collected and submitted 7 plant samples to Dr. Martin’s lab, and found one with SMoV and five with SMYEV. All infected plants were plug plants produced from tips grown by one nursery in the Great Valley area of Nova Scotia. Although four of Barclay’s samples were ‘Chandlers’, one such plant that looked “good” tested negative for both viruses, while another “good” plant tested positive for SMYEV only. Dr. Martin also tested 20 strawberry samples from Florida and found SMYEV and SMoV in 15 (75%). SMYEV and SMoV are very common around the world, and often occur together and with other viruses. In fact, it may be that they only cause significant problems in strawberry when they occur together. 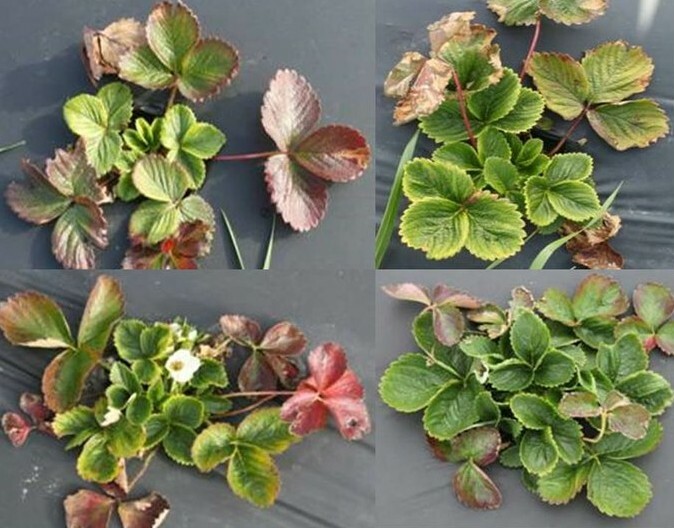 Yield losses (probably when 100% of plants are infected) can be expected to range from 0% to 30%, and can differ among strawberry cultivars and also depending on which “strain” of each virus may be present. These viruses are usually only a problem in matted-row strawberry production, where plants are in the field for a much longer period of time and plantings are not destroyed at the end of each growing season. Importantly, although the strawberry plant may show symptoms and yield less, fruit from infected plants are still edible and there should be no difference in taste. It is only supposed to be a problem when other viruses are also present. Most of the virus-infected plants diagnosed so far also had SMoV, which is also aphid-transmitted (C. fraegaefolii, several other Chaetosiphon species, and the melon aphid, Aphis gossypii). However, SMoV is “semi-persistently” transmitted, which means that aphids can “get” and transmit the virus within only a few minutes as they probe infected plants and then move to nearby healthy plants. However, aphids also “lose” the virus within a few hours as they probe plants, potentially slowing the initial rate of virus spread if most of the plants that aphids probe are healthy, such as when only a low percentage of plants in a field are infected. In addition to wild and cultivated strawberry, SMoV also infects several species of Chenopodium, including common lambsquarters. Aphid control programs are also supposed to be effective in reducing SMoV spread in strawberry fields. So, what are we to do about this situation? Growers with fields that “look good” and contain plants that weren’t sourced from the one nursery in the Great Valley area of Nova Scotia should NOT be “at risk”. One cautionary note: because these viruses are both transmitted by aphids, it is possible that active aphid populations in strawberry fields could cause “secondary spread” from infected to non-infected plants in the same field or in nearby fields (I doubt anyone knows exactly how close “nearby” is). Plants that were sourced from the one nursery of concern are likely to be infected by one or both viruses. Plants traced back to other, nearby sources in Nova Scotia could also be involved, but not as far as we know at this time. However, it’s very important to remember that apparent symptoms of plant virus infection can be very misleading. Sick plants may have similar symptoms, yet can be suffering from very different causes, none of which may involve virus infection. My experience with viruses in another crop (tobacco) suggests that factors such as production practices and weather conditions could have a major impact on apparent damage and yield loss. Even if a grower knows that their plants are infected, ensuring that they are doing everything that they possibly can to minimize stress on their crop could significantly improve their outcome this growing season. The factors that come to my mind for strawberry are frost protection, fertility, and irrigation/moisture stress. There is no cure for plant virus infection. Once infected, plants are infected for life, and every cell in an infected plant will eventually contain virus. There are no “silver bullets” or miracle cures, despite what some may claim. Infected plants can’t be saved, although growers could see some improvement in their appearance and growth between now and harvest. We don’t know why that is, so we don’t know how to promote it. This means that growers with infected plants should focus on preventing spread to healthy plants. Since we can’t test every plant, the safest assumption is that apparently symptomatic plants are infected, while those that “look good” aren’t, even though we know this isn’t always true. If almost all of the plants in a field are stunted and symptomatic, applying an insecticide will not help them. The only possible benefit from such a spray would be to minimize possible spread to nearby healthy strawberry fields. Treating severely-infected fields that are isolated is extremely unlikely to produce any benefit whatsoever. If there are enough good plants in a field that look to be worth saving, application of a systemic insecticide should be an effective treatment to prevent or minimize spread of these viruses. Scientists disagree to some extent on the effectiveness of this approach, but the plant pathology literature suggests treating can reduce further disease spread. Remember that this only works if there are aphid populations in the field. If there are no aphids, what is an “aphid-killer” going to accomplish? Growers may consider treating to prevent aphid populations from developing this spring as a type of “insurance”, but an alternative approach that should be cheaper and more environmentally friendly would be to scout fields more closely for aphids so that a crop is treated only if when determined necessary. If a grower decides to treat, the systemic insecticides need to be applied at least 14 days before bloom to avoid injuring pollinator populations. Recommended insecticides include imidacloprid (Admire Pro for drip, Provado for foliar applications) and thiamethoxam (Platinum for drip, Actara for foliar spray). There may also be some generics labeled for strawberry that have the same active ingredients, but may be cheaper. Don’t be too discouraged. This virus situation is yet another plant disease problem in strawberries tied to transplants that look healthy, but aren’t, but should be “containable” to this year. Those involved in strawberry plant production in Nova Scotia are aggressively working to correct their virus situation. Although many growers consider carrying strawberry plants over from one season to another, 2013 looks to be a very poor year for this. If possible, all strawberry plants (Note from Kathy Demchak – this means plantings that are known to be infected with the viruses in question, that show symptoms, or that were obtained from the nursery in question) should be destroyed after this season’s harvest is completed, to avoid potential carry-over of SMYEV and SMoV. Leaving potentially infected plants in the field this summer risks virus spread into next years’ crop. Fields in matted-row production should be monitored for potential virus incidence as well. Southern Region strawberry research and extension folks meet with national experts and Canadian representatives in late March to plan methods to avoid a repeat of this past fall. Regarding the recommendations Dr. Johnson discusses above for Virginia growers, which will apply just as well to Pennsylvania and New Jersey growers. Make sure that you scout for aphids, as aphids are needed for the viruses to be moved around. Don’t just spray without knowing whether you have a reason to do so. Treat plants if you find aphids, but be careful to observe label recommendations to avoid harming pollinators. Carrying over plantings for a second year is NOT a good idea if you suspect or know that your plants are infected. Take care of your plants no matter what. Giving up on them could ensure that infected plants perform more poorly, as well as healthy ones. 4) If you see plants that are stunted and showing symptoms depicted below, an additional option for smaller growers is to rogue plants – probably only practical if a relatively portion of them appear to be infected and they look noticeably worse than others (remove the plants from the field). Regarding the pictures, I’m guessing that most of you will wonder whether you have seen similar symptoms before. I’m wondering the same thing. Strawberry mild yellow edge virus is said to be the most common strawberry virus, and was first described in 1922, but symptoms only show up when a second virus is present. Much of the work done on strawberry mild yellow edge virus was done on older cultivars grown on the west coast through the 1950’s, 60’s and 70’s. 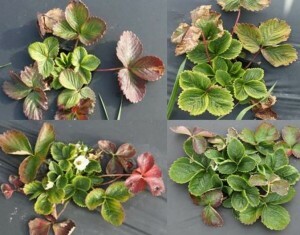 While the current work is finding the serious problems to be caused from strawberry mild yellow edge virus in combination with strawberry mottle virus, similar symptoms have been described when it’s been found in combination with three additional viruses, at least two of which I’m guessing are also around. Our native strawberries are susceptible to these viruses as well. Different strains of strawberry mild yellow edge virus that differed in severity had been documented in the past on the west coast. Further, there’s been some indication that plug plants seem to be healthier than fresh-dug plants planted in Florida even if infected. That might be because northern plantings had an opportunity to become well-established before fruiting begins. Plug plants originating from other sources (runner tips grown on-site or from tip suppliers other than affected one(s) in Nova Scotia), and dormant plants (as used for matted-row production or for summer-planted plasticulture) appear to be OK, though this does underline the importance of getting plants from nurseries that do virus testing and utilize tissue culture. For more information on the situation in Canada, you can “google” the words “Great Village Nova Scotia strawberry virus” for some recent newspaper articles. Note that one source describes the combination of two viruses mentioned above as a new mutant virus, but really, the problem is just that two viruses are present at the same time giving the plants too much to deal with – not that a new virus had formed. Current strawberry virus situation in New Jersey – After learning of the situation in the other states, Peter Nitzsche Morris County Agricultural Agent collected samples from two northern NJ farms and sent samples to Bob Martin of USDA ARS. As suspected, several of the samples from small or stunted plants came back positive for both viruses and some large and small plants tested positive for one of the viruses. This means the viruses are in NJ as well and growers should follow the recommendations stated above. New Jersey strawberry growers who purchased plants who tips were sourced from Nova Scotia should follow the above recommendations. If you have questions or concerns, please contact your county agent.